North Riverside is the 43rd most walkable neighborhood in Wichita with 4,105 residents. North Riverside has minimal public transportation and does not have many bike lanes. Nearby neighborhoods: Riverside, El Pueblo, Indian Hills Riverbend, Historic Midtown, Benjamin Hills, Indian Hills and Pleasant Valley. View Wichita apartments for rent. Most errands require a car in North Riverside Wichita. North Riverside is the 43rd most walkable neighborhood in Wichita with a Walk Score of 37. Find apartments in Wichita's most walkable neighborhoods: Old Town, Uptown and College Hill. 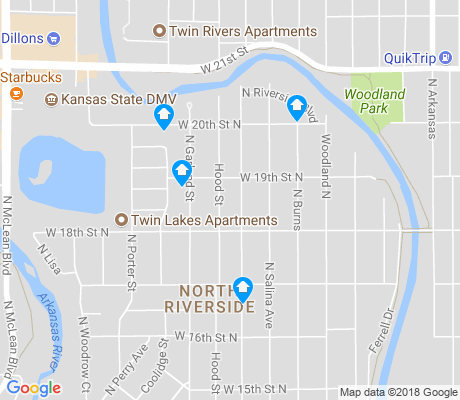 Compare North Riverside to other Wichita neighborhoods. Moving to Wichita from another city? There are about 34 restaurants, bars and coffee shops in North Riverside. People in North Riverside can walk to an average of 0.5 restaurants, bars and coffee shops in 5 minutes.